France recorded their second win at Twickenham in four games with a well–deserved 21-15 win against England on Saturday (21st March ) at Twickenham Stadium, giving them a chance to win back-to-back Six Nations titles. This was a much improved French performance compared to last week, although in practice their starting fifteen was little changed. Although three players from their sevens squad were in the team, only Sha’nnon Izar started, while the other change saw Audrey Abadie start at fly-half for the first time. Despite that surprise defeat, France started the match as favourites – and that was justified by an impressive start that had England defending in their half for much of the first quarter. Jessy Tremouliere had an early chance to get her team on the board when presented with a long penalty (circa 35m) chance in the first 10 minutes, which she took wih some ease. Jessy has been France’s best place kicker for some years, but has tended to be kept out of the fullback position by Caroline Ladagnous. With Ladagnous away with the sevens, Tremouliere has grabbed the opportunity to make the place her own and slotted the kick with ease. The confidence that this gave to her and her team was noticeable. England were also played better than in previous games and did have their chances, however – a great charge-down by Hannah Gallgaher just failed to bounce right a few minutes later. If she had been able to score perhaps the result might have been different. As it was France were able to increase their lead further on the 21st minute when Gaelle Mignot scored the regulation French try. Anyone who has seen France (or Montpellier) over the past two years will have seen this any number of times. A penalty lead to a French 5m lineout. A simple take became a driving maul which England could not stop, with Mignot touching down. Tremouliere added the extras and France were 10-0 ahead. The powerful French pack caused England no end of problems. French scrums as steady as a rock while English put-ins were always under huge pressure. Despite this ball in hand England could be threatening – Abbie Scott set up a great chance midway through the first half, stepping through the French line as if it was not there, and going on to win a penalty that resulted in a yellow card for Sha’nnon Izar – but England were unable to take advantage. Break-downs or set-pieces always seemed to favour France, whether they had the advantage of not. With a player advantage England had their best period of the game, but came away with nothing – indeed it was France who added to their lead with Tremouliere hitting another long penalty to make it 13-0. England pulled back three points thanks to the dancing feet of Katy McLean (clearly the most dangerous player in white throughout the evening) that gave Amber Reed a penalty opportunity, which she took. Halftime came shortly after – 13-3 to France, and concerns expressed that it might be more by the end. France continued to be on the front foot in the second half, but England were defending far better. An attempted drive from an early scrum only 8m from the English line was forcefully countered, but soon the French lead was back to 13 points as Tremouliere added her fourth successful kick. 16-3. But now it was England who managed to string some good phases of play together, with some patient build up work getting its reward when Hannah Gallagher got on the end of a neat pass from Laura Keates to score a much needed try. Reed couldn’t make the conversion and England trailed 16-8 with 20 minutes left. France were not finished – and Izar was trying some sevens’ style party pieces. In one great move a neat little dink ahead set up Celine Heguy who also saw space to kick ahead herself for Caroline Boujard – who had just come on – but Boujard was just unable to finish. Another driving French scrum on 5m was scotched by England – as was the following driving maul – but France were not to be frustrated forever. Instead the ball came out to the backs and in a thrilling move first Billes then Boujard had chances to score before finally Tremouliere touched down in the corner. She was unable to hit the target with the kick from wide to the right, but France were now 21-8 ahead. Nevertheless England responded well and the forwards started to turn the screw in the French 22, as France turned to the bench to see the game out. The eventually pressure told and it was Harriet Millar-Mills touched down to make it 21-15 after Reed’s successful conversion with ten minutes to play. England could now steal the game, but the French defence held firm and at the end they were happy to take a six point win – and will now be watching for scores from Cumbernauld. England Coach Nicky Ponsford said: “It is disappointing to finish fourth but we started the campaign with the aim of blooding several new players and developing them as we build towards the next world cup in 2017. We have done that and all the players have progressed game by game. They have got more and more competitive and we finished the championship pushing France to the end. It has been a very open tournament, and today, although ultimately it was not the result we wanted, we put in a much better second half performance. “In the second half we really started to play some rugby and try the things we’ve been trying to do. As I said to the players after the game, compared to where we were at the start against Wales we’ve made a step on in every game and that is a positive we can take away”. We also caught up with Rocky Clark, after the game which had seen her record her 100th cap for England. “It was a really tough game,” she said. “We knew it would be but we are disappointed that we did not perform as well as we should have. There were elements that were good – when we went wide and played the phases we were happy with that, but we didn’t front up enough throughout the game to get us a victory”. She also singled out praise for Jessy Tremouliere, highlighting the difference a “really good goal kicker” had bought to the game. 15. Jessy Tremouliere (Romagnat); 14. Céline Heguy (Bayonne); 13. Shannon Izar (Lille –Villeneuve d’Ascq); 12. Elodie Poublan (Montpellier); 11. Julie Billes (USAP); 10. Audrey Abadie (Blagnac -Saint Orens); 9. Yanna Rivoalen (Lille –Villeneuve d’Ascq); 1. Lise Arricastre (Lons), 2. Gaëlle Mignot (Montpellier), 3. Patricia Carricaburu (Lons); 4. Manon Andre (Blagnac -Saint Orens); 5. Audrey Forlani (Blagnac -Saint Orens); 6. Coumba Tombe Diallo (Stade Bordelais), 7. Laetitia Grand (Lons), 8. Safi N’diaye (Montpellier). Replacements: 16. 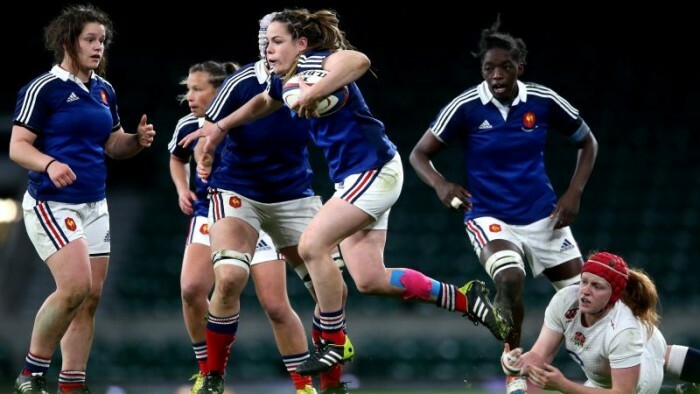 Wendy Divoux (USAP); 17. Julie Duval (Ovalie Caennaise); 18. Sophie Pin (La Valette); 19. Pauline Rayssac (Montpellier); 20. Jennyfer Troncy (Montpellier); 21. Marjorie Mayans (Blagnac -Saint Orens); 22. Caroline Boujard (USAP); 23. Amaya Gonzalez (Bayonne).